Heat the oven to 190C/170C Fan/Gas 5. Beat together the butter, lemon zest, leaves of the thyme and a good pinch of black pepper. Gently lift the chicken skin from over the breast meat at the end closest to the legs and use your hands to spread the butter over the meat, under the skin. Cut the lemon in half, squeeze out the juice and set aside to use later then put the lemon, along with the thyme twigs, inside the chicken cavity. Sprinkle a little salt over the skin and roast in the preheated oven for 1hour 45 minutes, basting twice with the cooking juices during roasting. Once cooked, remove from the oven and set aside to rest. Put the watercress in a large bowl, add the sliced spring onions, halved cherry tomatoes and olives. Combine the reserved lemon juice with the rapeseed oil and crushed garlic. Leave 2 tablespoons of dressing in the bowl and use the rest to dress the watercress. Toss well and load onto a serving platter. 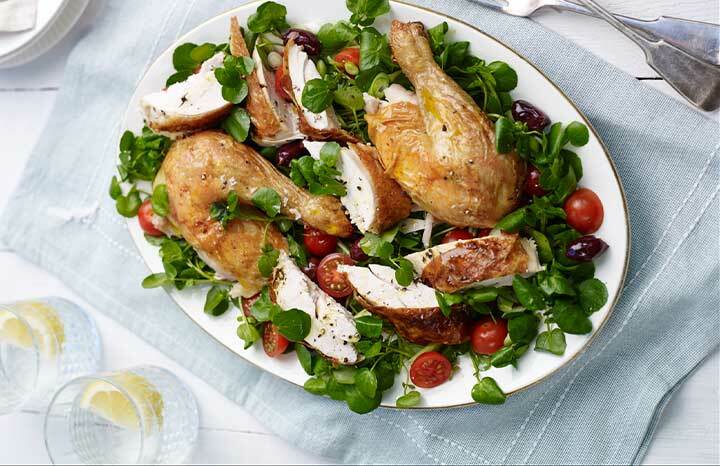 Carve the chicken and arrange the meat on the salad. Drizzle with the remaining dressing and serve. For more great recipes see Yours Magazine, out every fortnight, on a Tuesday.